November 12, 2018 | Filed under: Current Articles,Featured | Posted by: Alex A. When Justify won the Triple Crown this summer, win photos showed him sporting two different silks: one representing WinStar Farms and another representing the China Horse Club. It’s most likely the first time that a Triple Crown winning Thoroughbred has been owned by one, or more, ownership syndications. Fractional ownership groups, partnerships, and syndications are popular in the world of horse racing, as the struggling industry looks for ways to attract new owners into a sport that comes off as one only the rich can afford. 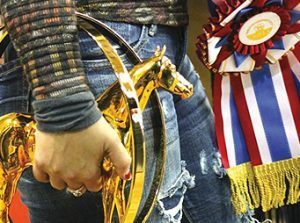 In the horse show industry, it’s a trend that’s slowly catching on as well. Why Own in a Group? 1. How involved do I intend to be? 2. Will my schedule allow me to spend time monitoring my equine investment? For example, will I be able to visit the trainer often, or is the trainer located so far away that I might only get to see my horse at the major shows? 3. Will my budget allow me to solely fund this horse and his efforts, or I will I need help? Owning a horse within a joint venture allows you to be comfortable in your own financial situation. Would you rather assume all of the risks of a top contender, or would you rather spread the risk and share the rewards?